Posted on Wed, Dec 14, 2011 : 3:15 p.m. It's not always convenient purchasing a freshly-baked baguette to serve with so many appetizers. 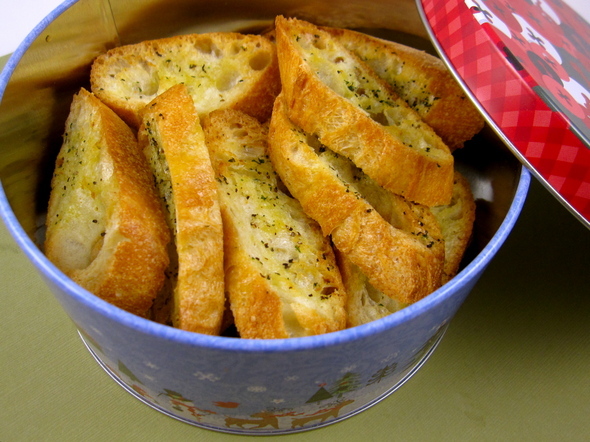 Thankfully, there's always crostini, which can be made ahead and stored in a tin several days in advance. Season the crostini to complement the flavors of whatever dishes you plan to serve. For example, my Rabbit & Pork Belly Terrine requests a bit of pepper — perhaps a tad of ground fennel. My friend Debbie’s super-simple Gorgonzola-Pear Spread would be happy simply served with a crostini enhanced with dried parsley for color. And if there’s no time for crostini or a baguette, a plain water wafer, such as Carr’s, is a good choice. 2. Arrange baguette slices on a large cooking sheet, lightly oiled or lined with silpat. 3. Rub cut side of garlic over crostini. Whisk together oil and herbs. Brush over baguette slices. Bake on center rack for 5-8 minutes, or until golden brown and crispy. Watch carefully in the last couple of minutes to insure they don't over-brown. My new web site (packed with holiday recipes) has recently been launched. (www.dinnerFeed.com)! I'm a real-time food writer and photographer posting daily feeds on my website and in the Food & Drink section of Annarbor.com. You may also e-mail me at peggy@dinnerfeed.com. Wed, Dec 14, 2011 : 12:54 p.m.
Peggy! This would pair well with Fromager d'Affinois - a rich French soft cheese. I can already taste it!